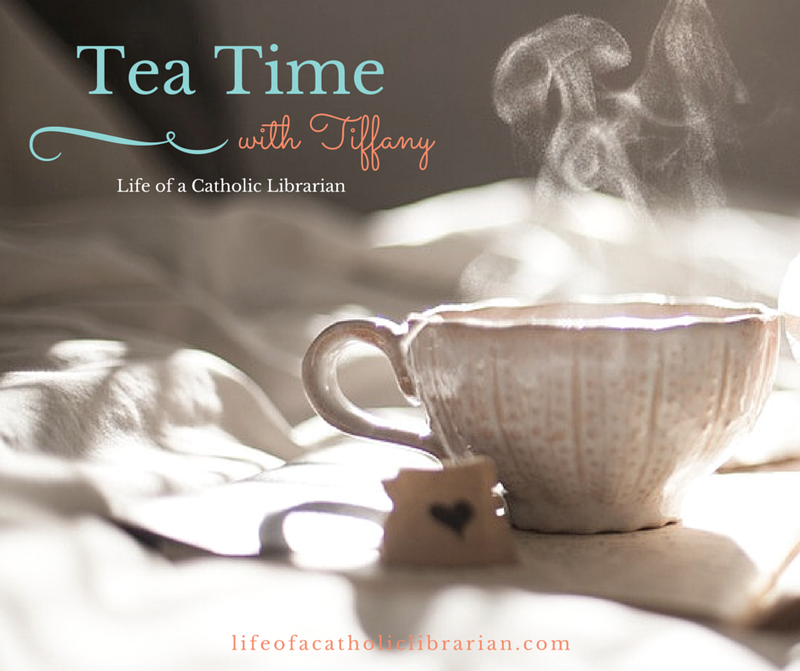 Life of a Catholic Librarian: Tea Time with Tiffany #15 - Are you doing any differently in your spiritual routine this fall? Tea Time with Tiffany #15 - Are you doing any differently in your spiritual routine this fall? Routine has been a theme here this week, yes? Despite the fact that I recorded this week's video a few days ago, it fits in nicely with the theme. I just watched it so that I could gather the show notes together, and MAN, my hair is crazy in this one. :0 But my week has improved, and so I'm feeling perky today as I write this. It helps that (background discussion is in the video) this morning, despite the fact that I had to start the day with a DENTIST APPOINTMENT (is there a worse way to start one's day? I ASK YOU), when I arrived on campus at the worst *possible* time of the morning, much later than I usually arrive, as I was innocently patrolling the staff parking lot, Hark! Someone was pulling out! The fall always brings a feeling of new beginning into my life, and I begin to think about Advent. In preparation for that, I generally get all excited and try out new things. What's on my mind in that regard this particular September? View on, gentle viewer! 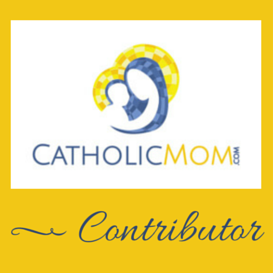 Catholic Book Club reading list has been updated through January 2016! Read along with us! The next book we'll be discussing is Chasing Francis: A Pilgrim's Tale, by Ian Morgan Cron, on Sept. 30th. Sacred Reading: The 2016 Guide to Daily Prayer, published by Ave Maria Press. I'm going to be trying this out, starting in Advent, for lectio divina! I mentioned in the video that I wasn't sure if it covered just the daily Gospel or all of the daily Mass readings. I checked the sample pages, and it looks like it's meditations on the Gospel alone. Saint dolls from St. Luke's Brush. This year Henry will be receiving St. Nicholas, and Anne a rosary case with a painted rose adornment. Adoration. No substitute for it. I'm going to try bringing my kids. Have any of you tried this with your kids? How did it go? Gentle reader, how I do appreciate being able to share time with you like this. It really buoys my spirits, especially during this busy season. What are you incorporating into your spiritual life this fall? And if you've taken children to Adoration with you, please do write in with your tips! You gave me a lot to think about. I'm really good about going to adoration in the winter aka lent once or twice a week but often in the summer/fall fall off the band wagon. It doesn't help that where I currently live the only adoration chapel only has it from 9-3 when I'm at work otherwise I have to drive about 45 minutes. I might instead devote time in prayer at the mission grounds not far from my house that are always opened. It is a very spiritual place to walk around and pray. Funny story right after I watched your video I was going through email and received an email about LENT 2016. I was like can we slow the year down? I'm not ready to think about Lent yet!! I LOVE St. Therese of Lisiuex (although it's kind of biased as she is my confirmation saint) but I will be praying her novena. It's not really spiritual but it's part of my fall and I'm doing a 31 days blogging challenge in October I'm looking forward to hopefully write a few spiritual posts. Something I am doing for my new spiritual routine is cleaning and organizing the apartment. This summer I have fallen into a bit of a slothful habit (can you say blobbify ... I knew you could!). So I am in a fall cleaning mode, throwing stuff out, giving stuff away, clearing physical space and I find it is subtly influencing my prayer life by getting rid of a lot of stress. Beth Anne, oohhh, this is all great fodder, thank you! Yes, last winter I had a great Adoration stretch going, and then the weather got horrible, and so driving there after work was dicey, so I took a few weeks off, and once I get out of the habit of doing something? Yep, off the bandwagon. :) But going to try again! Because we are very lucky and have a chapel within a 10 minute driving distance of both home and work. Lent 2016? Yeah, I think we have some time. :0 I *did* already pre-order my Magnificat Lenten Companion, but only because they make it so easy to order Advent and Lent together, then I don't have to worry about forgetting. Neither has shipped yet. St. Therese, right?! I forgot to put this in the show notes, but I did create a page for the novena, so prep work is definitely underway over here! Looking forward to praying with you! Marika, oh that a fabulous idea! There is definitely a correlation there between de-cluttering and freshening up our spiritual lives as well. More quiet in our space for contemplation and prayer, yes? We need to do an annual sweep of our storage space to tidy things up and get rid of some stuff, and I'm dreading it, but I know that it is extremely necessary. I love it when whole families stop by our Adoration chapel, even if it's just for a few minutes. Some of the most profound thoughts and questions about Christ and the Church come from our youngest parishioners either during or just after they've spent time in Adoration. Mary, thank you so much for this! Yes, even just a few minutes can pack a powerful punch, right?